When a hotel guest or master folio's charges are billable, you will use the payment code DB when checking out the guest or closing the master folio. You also may post the payment code DB at any time; for example, if you have a master folio for a company so that you can post POS charges to it, you may post DB payments to the master folio weekly or monthly prior to billing. See Front Desk Operations for detailed instructions on posting to folios. The DB transactions posted to folios are held in a temporary file until night audit. 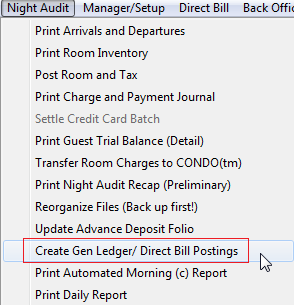 Then the direct bill invoices are created when "Create Direct Bill postings" is run from the night audit menu and the temporary file clears. 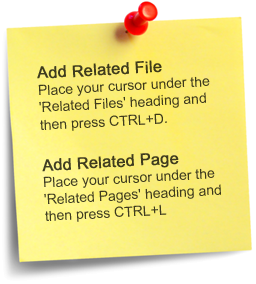 Your menu item may read differently, such as "Create G/L, city ledger postings" depending on your settings but it does the same thing. See sample night audit menu below. The night audit procedures should be done in order and only at the end of the business day. The DB payments to folios have become invoices in Direct Bill once after the night audit posting described above. Each DB posting will create an invoice in the customer's account. Below is a sample direct bill batch created during night audit. Below is the customer detail for Customer SAND showing the two transactions. The invoices will be listed on the Customer Open Item Statement. The folio number displays in the "REFERENCE" column. Should you need to view or print the folio, you may look it up. If the guest was checked out or a master folio closed, the folio will be in Guest History. Otherwise you may go to Display Folio to view in-house folios.